Hi everyone! The Christmas season is over for me, finished up with a bit of Boxing Day shopping yesterday. While I'll miss the Christmas festivities, I'm still really excited for some New Years manicures.This year I'm really feeling glitter and metallics. I'll be incorporating both into the four upcoming manicures I have planned out to show you. Expect a lot of glitz and glamour in varying metallic hues to match your NYE statement bling (haha). 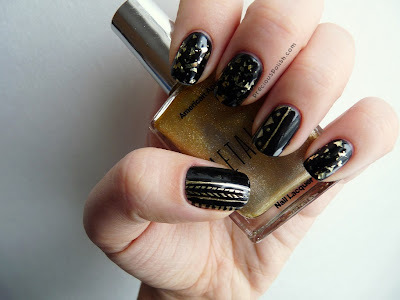 First up is an edgy gold tribal and shard glitter manicure. I love the look of all the 18kt gold topcoats being released but I'm not so crazy about their price tags. Instead my sister gifted me American Apparel Meteor Shower for Christmas; a clear base with a generous amount of gold shard glitter. It's not quite like the gold flakie topcoats but it perfectly satiates my craving, and for only a fraction of the price! I applied American Apparel Hassid to all of my nails. On the accent nails I painted half of the nail with American Apparel Gold Flash and used a black striping polish to paint the tribal design. I topped off the rest of the nails with American Apparel Meteor Shower. I love this colour combo. Looks great!